I am about to enter a busy season for Lucy Jo Photography, and I believe I have started it off just right…in front of the camera. It is always so good for me to understand what it feels like for my clients as they take the spotlight in front of the camera, unsure of what they look like. As my friend snapped photos of me, I was surprised how vulnerable I felt and how much guidance I wanted. I can see now how important a photographer is in helping ease their clients and produce moments that are authentic and beautiful. I don’t normally get photos taken of myself, but as I grow my blog and business, I thought it was time. I spent time thinking about my outfit, my makeup, the backgrounds, the feelings I wanted to convey and the timing of the session. It is no small task to get ready for photos and that was just me. When families get ready, the pressure is so real. Moms want to look nice and they understand that since they are the ones that want to document their family, they have to push for the rest of the family to look and act their best too. Coordinating outfits, arranging plans with the photographer and trying not to fight with the spouse are just some of the jobs of a mom, or I suppose a dad in some cases. Then there is the matter of acting normal in front of a camera and hoping that the rest of the family will be able to deal with getting those shots you want too. 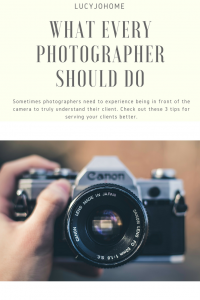 Long story short, getting your pictures taken can be stressful, so all photographers should schedule a session to have their own photos made so they can better meet the needs of their clients. I am now excited to give my clients an experience that is fun and authentic. Here are 3 things to consider as you prepare for your next session. What do I do with my hands and body? Your clients need guidance. They are literally wondering, “Should I put my hand here?” “Does this look ridiculous?” “Are you making me look small or large?” “Double chins are not my thing.”After learning from Sue Bryce, I am amazed at how much body movement and placement can change the look and feeling of a photo. Learn what looks good and how to give good, gentle instruction during sessions. Also, you want to give families things to do so they focus more on the task and less on giving you a cheesy smile or a contrived pose. One of my favorite family photographers is Angie Monson and she gives so many great examples of how to get families interacting and being real. If clients do not feel like they are interacting with a real person, they are going to start acting robotic because in a way they are only paying attention to the machine in front of your face and not on their family relationships or their own feelings. Pull your camera down in-between shots and talk to them about real things. Spend time before you even start the session talking and acquainting yourself with them. In between locations, chat with them and just be on the look out for those awesome shots that are spontaneous and usually stunning. Avoid long silences because that will make your clients start to doubt themselves. Give compliments and smile. Genuinely talk with your clients and the session will be more fun for them and you. I get nervous before every single session. There is a lot of trust given to me when I capture a family or individual. They have spent a lot of time and energy getting ready to have photos that they love, and I don’t want to disappoint. No matter how prepared I feel, there is some nervousness, so I always give myself some time to “cool” down and remember who I am and what my service is all about. There have been times in my life where I thought trying to imitate someone else would bring me success; the fact is that success comes when you are being you. Even if you are good at pretending, the pretending is not sustainable and your clients are going to be able to see through it. Just focus on being the best version of yourself and serve those that appreciate what you do. Always remember that you cannot please everyone and that your greatest attest is the art that only you can create. As you collect yourself and find confidence, it will allow your clients to feel comfortable and confident too.